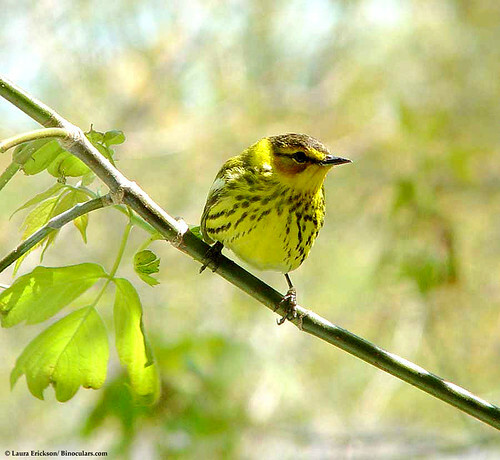 This is the warbler most often attracted to oranges and jelly feeders during migration. One frigid spring, Laura had one visiting a hummingbird feeder without perches—the little guy actually hovered at the feeder for a second or two slurping sugar water, then alighted on a nearby branch to rest a bit, and repeated. Cape May warblers winter in the West Indies, feeding on nectar and some insects. They breed in northern coniferous forests, where they feed mostly on insects, especially spruce budworm. They’ve declined a full 72 percent since 1966, thanks to pesticide formulations targeting their primary food source. Because they’re easy to see during migration while feeding on nectar, birders often don’t appreciate how much their numbers have dropped over the past 50 years.